Despite having been around for a long time, telnet is an invaluable tool for testing a mail server. It allows one to pinpoint errors in the process – some which are not logged – and to quickly validate that things are working. Moreover, it enables one to get a better understanding of what their mail server expects, which in turn allows for better code to be written for sending emails. Granted, excellent libraries (such as PHPMailer) exist for this sole purpose, but learning something new never hurts. Since it seems that the general populace has little use for telnet, many modern operating systems do not have it installed by default. 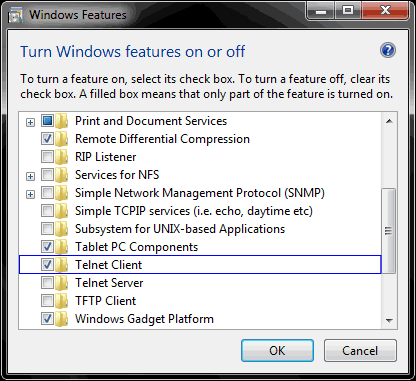 In the case of Windows 7, the telnet client is a Windows feature that can be added by going to: Control Panel > Programs and Features > Turn Windows features on or off, and checking ‘Telnet Client’ from the list of Windows Features that appears. 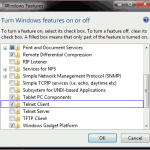 Note that on Windows’ telnet, if you make a typographical error, backspace will not be able to correct it – the command sent to the server will be invalid. Once we have telnet installed, it can be invoked from the command line. With regard to connecting to a server, don’t forget that some ports available internally may be firewalled to prevent access from the outside. In the case of EC2, this includes any firewalls (e.g. ipTables) running on the instance, as well as the security group settings for the instance. The 2xx series status codes indicate success, 4xx series status codes indicate temporary failures, and 5xx series status codes indicate permanent failures. In the case above, 220 indicates that the service is ready, the server returns its name (example.com) – this need not match the name of the server you connected to, ESMTP means that the server will accept an extended set of SMTP commands (most servers do), and Postfix is the name of the server software (other common examples being Sendmail, Exim, and Qmail). It is at the server’s discretion what is returned, some will not provide a similar greeting or will exclude some parts seen above. Keep in mind that this is a conversation with the server – it says something, and we are expected to reply. The polite reply to someone saying hello, is to respond in kind, so we will greet the server and identify ourselves. There are two commands that can be used in this greeting, HELO (which implies the default set of SMTP commands), and EHLO (which implies the extended set of SMTP commands). In most cases, we want the latter. Greeting with EHLO will also provide us some information about the server that HELO does not provide. That is it – the mail server just responded that the request for mail action was okay and was completed. We can now start sending mail commands to the server. Most servers however, should require some form of authentication before they will send mail that doesn’t originate from their network (while some servers simply won’t send any mail not originating from their network). Each line provides some information about what the server requires or will accept. Of particular interest is the AUTH line which indicates which forms of authentication are supported by the server. Most servers will differ in their response, including some lines and excluding others depending on how they are configured. Keep in mind that if telnet-ing on localhost, some servers are setup to not require authentication from machines on the same network, and will not display the AUTH line. This particular server requires authentication to send an email – that means a valid username and password, recognized by the mail server. Mail servers typically implement authentication through SASL ((Simple Authentication and Security Layer). On the client end of things, the accepted types of authentication are provided on the AUTH line (in this case, plain and login). Since usernames and passwords may contain usual characters, mail servers expect them to be base64 encoded. You must remember, however, to ‘escape’ (precede with a backslash) special characters (e.g. @). In PHP the special characters that might need to be escaped include the double quote (“), backslash (\) and dollar sign ($). To exit interactive mode, type quit. In both languages above, a NULL byte can be represented with \000 (although \0 will usually work, if the following string starts with a number, the character code may be misinterpreted). As an aside, a couple of quick points of mention – firstly, you will often note an equal sign (‘=’) at the end of a base64 string, it is a result of padding – you can expect to see 1 or 2 equal signs at the end of your string if the length of the input string is not evenly divisible by 3. The last response from the server was a list of what the server accepts and expects from us, to proceed we need to authenticate ourselves with the server. Our options, listed above, are LOGIN and PLAIN. That line, is the base64 response from the server – if we translate it, it reads “Username:”. The 334 status code indicates a server challenge (i.e. it is waiting for us to enter authentication information). As the error suggests, the 535 code indicates that the authentication credentials are invalid. To resume from this we need to restart our authentication (i.e. the next command should be AUTH LOGIN). Keep in mind though, that many servers are not tolerant of invalid authentications, and even if you do successfully login, the server might not send your mail. We can now start composing the email itself – for this, we need 3 parts, a from address (MAIL FROM:), a to address (RCPT TO:), and the email itself (headers + body) (DATA). The MAIL command must precede the RCPT command, which must precede the data command – the server will not accept the information in any other order. Note, that the server has provided instructions on how to end the email – a period on its own line. The 354 status code tells us to start the mail input. This is an email, sent using telnet. If sending multiple emails, it is not necessary to disconnect from the server and reconnect (and re-authenticate) between each email. We would simply continue from here with another ‘MAIL FROM:’ line and write our next email. -- 1 Kbytes in 1 Request. The above log displays the login (and associated IP), the FROM and TO values entered, as well as the status of the email. Finally, when the email has been processed, it is removed from the queue. Note that in most cases, commands are not case sensitive, and can be entered as either upper or lower case (or any combination thereof). C: This is an email, sent using telnet. This entry was posted in Software, Systems Admin and tagged email, postfix, smtp, telnet by cyberx86. Bookmark the permalink. awesome, thanks, just what i needed… help on the base64. Saved me so much time. Glad you found it useful. Thanks for reading and commenting. Great to know it was helpful. Thanks for reading and commenting. Thanks for the comment and the ServerFault link – looks like a bug in s_client, but will definitely be helpful to a few people.